In the text of Sri Narada-Pancaratra, in the Second Ratra, Sixth Chapter, it is written – “Just as Sri Krsna is the universal father, Sri Radha is the universal mother. Both of them are fundamentally the same. Just as milk and its whiteness are non-different, similarly there is no difference between Them. Sri Radha, who resides at the chest of Sri Krsna, is like the left part of His body. Sri Radha is situated at the chest of Sri Narayana as Maha-Laksmi, She is the mother of Vibudha as Sri Sarasvati, She is the daughter of the ocean of milk (ksiroda-sindhu) situated at the chest of Sri Visnu as Sri Laksmi-devi, again She is situated in Brahmaloka on the chest of Sri Brahma as Sri Savitri-devi. In ancient times Devi appeared as the personification of Sri Hari’s mercy as Bhagavati by the power of the demigods and after annihilating the demons, gave Indra, the king of the Devas, his kingdom back safely. By the order of Sri Krsna that eternal Bhagavati, the illusory potency of Visnu, later appeared in the form of Sati, the daughter of Daksa. Again after leaving her body due to hearing blasphemy of her husband, she appeared as Parvati, the daughter of Himadri, who is the very personification of all power and the destroyer of all obstacles Durga-devi. It is only Sri Radha who is the very personification of the supreme intelligence and wealth of Paramatma Sri Krsna; it is only She who is the personified Svarga-Laksmi, who dwells in the residence of Indra in the heavenly planets; She is Raja-Laksmi who resides in the houses of kings of this earth, She is Grha-Laksmi who dwells within the homes of ordinary people, She is the village-goddess of various villages, She is source of truth found in water (satya-svarupa), She is the source of smell within the earth (gandha-rupa), the source of sound within ether (sabda-rupa) and the source of beauty (sobha-rupa) in the moon. She is lustre and the source of lustre found in the sun and great kings; She is the burning potency of fire and the personification of all strength found in the living beings. During the time of creation that Goddess is the principal controller of material nature (mula-prakrti-isvari) – She is the mother of Maha-Visnu. Maha-Visnu is great and all-expansive – all the universes manifest from the pores of His body, hence He is naturally famous as ‘Vasu’ and since His Lord is Sri Krsna, He is famous as ‘Vasudeva’. Therefore, one Krsna, due to His various pastimes, manifests infinite numbers of different forms. There is no difference between the powerful (saktiman) and the power (sakti). The only distinguishing characteristic is that the Power is under the control of the Powerful. Just as Sri Krsna is the male fountainhead (amsi), the Lord of lords (sarvesvaresvara) and the primeval Svayam-Bhagavan (original Godhead), similarly, Sri Radha is the female fountainhead (amsini) who is the main reservoir of all potencies – She is the Svarupa-sakti (the highest potency of the Lord), Svayam-rupa (the original feminine form) and Svayam-bhagavati (the original Goddess). Sri Krsna is completely powerful (purna-saktiman) and Sri Radha is the complete potency (purna-sakti). In Vraja the second bodily expansion of Svayam-rupa Sri Krsna is the original Sankarsana, Svayam-prakasa Sri Baladeva. This Krsna-Balarama of Vraja manifest Their aisvarya (opulence) as the first catur-vyuha in Dvaraka, namely Sri Vasudeva, Sankarsana, Pradyumna and Aniruddha. In Maha-Vaikuntha this manifests as the second catur-vyuha. In this second catur-vyuha, Sri Balarama takes the form of Maha-Sankarsana, whose partial representation is the first purusavatara, Karanabdhisayi who is lying on the Causal Ocean. He is the principal cause of the countless material universes. He then fills up half of every universe with water emanating from the pores of His body and in that He manifests Svetadvipa where He lies on the bed of Sesasayi. As He lies there, Laksmi-devi serves His lotus feet. He becomes Garbhodasayi – the second purusavatara. From the lotus emanating from His navel, Brahma is born. He again becomes the third purusavatara lying on the ocean of milk – the Paramatma within the hearts of every individual living being in the material universe. The second purusavatara, Garbhadakasayi, enters every universe as the indwelling Paramatma of the collective living beings (samasti-jiva), and the first purusavatara, Karanadakasayi, is the indwelling Paramatma of all living entities of the countless collective universes. Thus, one Krsna, by the effect of His acintya-sakti (inconceivable potency) has manifested His catur-vyuha forms – He also manifests in infinite forms such as Brahma, Visnu, Mahesvara etc. The non-dual eternal form of the Absolute appears as the sound of the one-syllabled pranava (om) and, although it expands into many syllabled forms such as Sri Gopala, Rama etc. those various forms are based on knowledge of the one non-dual Absolute. This means that that Absolute Truth, who is one without a second, by His own eternal potency, has manifested the catur-vyuha. The syllable ‘a’ of the pranava manifested Rama, the son of Rohini. The syllable ’u’ has given rise to Pradyumna and from the syllable ‘m’ Aniruddha appeared. The syllable ‘a’ presides over all and represents the awakened state (jagrata). The syllable ‘u’ presides over the dream state (svapna), and the syllable ‘m’ corresponds with state of sleep (susupti). But Krsna is turiya-vastu – He is transcendental to the aforementioned three conditions of jagrata, svapna and susupti. He is the inexplicable half-syllable that cuts off the vowel, the complete sound of the pranava and the Complete Absolute (purna-brahma). The whole universe rests upon Him, the ever blissful Krsna. "Rukmini is in Dvaraka what Radha is in the forest of Vrndavana." 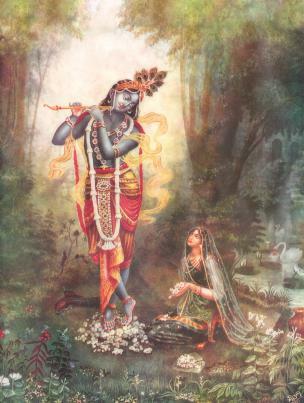 "Among all persons, it is Radha in whose company Madhava is especially glorious, as She is especially glorious in His." For this reason, it is mentioned in the Narada-pancaratra that during the time of the creation of the universe, Mula-prakrti-isvari, the primeval goddess of material nature (Sri Radhika Herself) gave birth to the Maha-Virat-Purusa, Karanabdhasayi Maha-Visnu, who is the cause of infinite numbers of universes. Thereafter, from the tip of the Goddess Radha’s tongue, the white complexioned Sarasvati-devi, the goddess of all scriptures, appeared dressed in yellow garments and holding a vina and books. Then Radharani further divided and Kamala-devi (Laksmi) appeared from Her left side. The right part of Her remained as the form of Radha. Seeing this, Krsna also divided His form. His right half remained as the two-handed Krsna, His left half manifested the four-handed Narayana. By the will of Krsna, and by the will of Sarasvati and Radharani, Laksmi became the consort of Narayana. Narayana went to Vaikuntha. Due to being manifest from Sri Radha, Laksmi and Sarasvati remained childless. After this, from the limbs of Narayana, many four-handed associates, who were as effulgent as Visnu, were born. From Kamala-devi’s limbs millions and millions of maidservants manifested. All of them became companions of Laksmi. Then, from the pores of Sri Krsna’s body, innumerable gopas appeared and from the pores of Sri Radha’s body, innumerable gopikas were born. However, due to Krsna’s curse, they were all childless. Then, from the limbs of Krsna, Durga-devi appeared, who is known as Sanatani (the eternal one), Visnu-maya (the potency of Visnu), Narayani (the energy of Narayana) and Isani (she who fulfills all desires). It is her illusory potency that has bewildered the three worlds. After this, from the lotus-navel of Sri Krsna (from Garbhodasayi) appeared four-headed Brahma and on his left was a woman of unparalleled beauty (Savitri). This husband and wife chanted many prayers to Krsna. Then Krsna further divided Himself and His left part became Mahadeva, while His right part remained the same as the Lord of the gopipikas. Mahadeva, with his five mouths, started krsna-nama kirtana. 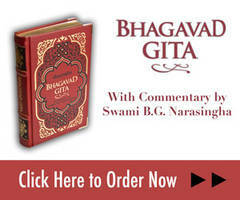 Thus many similarities can be seen between the statements of Sri Narada-pancaratra and the Brahma-vaivarta Purana. In Sri Visnu Purana this Brahma-vaivarta Purana has been termed as the tenth Purana – dasamam brahma-vaivartam. This means that after pronouncing the word ‘Radha’ one should pronounce the word ‘Krsna’ or ‘Madhava’ (ma means Laksmi, dhava means ‘Lord’, thus Madhava means ‘the Lord of Laksmi’). If someone chants it in the opposite way, he will surely incur the reaction of killing a brahmana. Sri Krsna is the Supreme Father of the universe. Sri Radhika is the Supreme Mother of the universe. The mother is a hundred times more respectable, worshippable and honourable than the father.